If you go in search of “Mount Calvary,” you may find it difficult! To find it in the Bible is no simple task. Actually, it only appears once in the Bible…and then only in the King James Version (Luke 23:33 KJV), where the original translators chose to use a transcription of the Latin word “Calvariae” rather than translate it. In other translations, “Golgotha” or “place of the skull” is used. Similarly, if you go in search of Calvary’s actual geographic location, you may be challenged. There is a traditional site, where the Church of the Holy Sepulchre is built. Meanwhile, recent arguments point to the possibility of another location. Regardless of our present-day challenge of locating “Calvary,” let there neither be question of its existence nor of its significance. 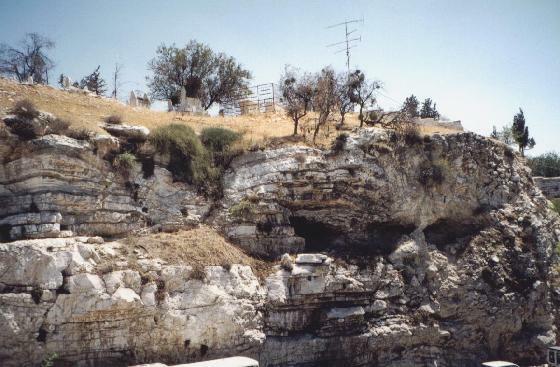 Whether we refer to it as Calvary or as Golgotha, it is the location of the crucifixion. Whether we believe it to have taken place at a traditional site or another location, the crucifixion really happened. Mount Calvary was the place where Jesus was nailed to the cross. It was the place where the cross was placed upright. It was the location where Jesus bore our sins and nails bore His body. It was the site where some spectators ridiculed while a handful of ladies and John mourned. It was the spot where His clothes were divided. It was there that He died and His side was pierced. Arguably, no other location on the face of the earth has greater significance than this. It was at Calvary, that the price of punishment for sins was once and for all paid through the sacrificial death of Jesus. And because of that one act, forgiveness and hope are available to all! This entry was posted in John, Mountaintops. Bookmark the permalink.